We were part of an event at the Palmer House in Sauk Centre, MN. This event was hosted by Spooky Dudes Paranormal Investigations and took place on October 29th and 30th of 2010. 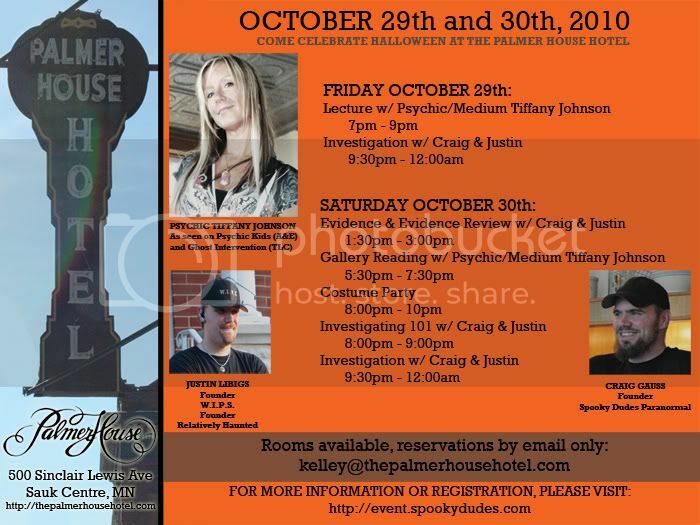 Justin Libigs of our team and Craig Gauss of Spooky Dudes taught a Paranormal 101 and an Evidence and Evidence review class at the event, and they also led an investigation of the Palmer House for 2 nights. This event featured the talent of psychic Tiffany Johnson and hosted other members of "Relatively Haunted". Craig also wrote a blog about this event. Sorry if you miss it, we really packed the place and had a great time!